This bonus will no longer be available after April 30, 2019. Register at GreySnowPoker through BankrollMob.com and receive $5 Tourney Bucks (No Deposit Bonus)* to use in daily tournaments. Also, check out the lobby for Freerolls and Private Tournaments just for BankrollMob members. When you are ready to make your first deposit, then you can also claim a 100% up to $1000 bonus! *$5 Tourney Bucks are credited to new eligible player accounts within 48 hours after account creation. The $5 Tourney Bucks will not show in the poker lobby balance but in the cashier under "Bonuses and Rebates". 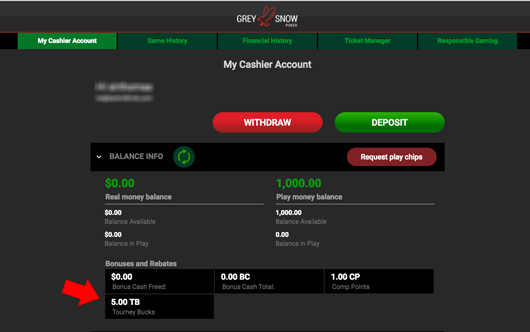 By playing poker at GreySnowPoker, you benefit from a system that charges zero rake during hands played and instead takes a 3% service fee from players leaving a table. We are loyal to players who are loyal to the tables – a longer session never demands more fees paid for your play. Instead of following industry standards and raking as much as we can justify - before sprinkling a few pennies into the pockets of lucky players - GreySnowPoker is loyal to its players from the get-go: every time you sit at a table, 1% of your buyin is awarded to you in loyalty points which can be converted to hard cash. It’s that simple: the GreySnowPoker stewards of the poker ecosystem give you direct cash back on your stack every time you sit down. If you already have an account (playmoney/realmoney) with GreySnowPoker, then you are wasting both yours and our time by creating a bonus request! Below you can see what Facebook users are saying about this free GreySnowPoker no deposit bonus, and also leave your own comment. Questions? Use our Support page - we do not offer support in Facebook comments!